The party knew very little about Gregor. He was first encountered outside the city of Silverymoon, at a Shrine to Fharlanghn. He was there with a couple of other adventurers. Greywing and Quinton. The three of them were members of the 'Cleanup Crew' until the group decided to hire out as mercenaries to a clan of exiled Duergar from a Dwarven fortification called 640. Gregor is a Hakheerian Barbarian. As anyone who meets Gregor can clearly observe, apart from having four arms, Hakheerians are basically Human. 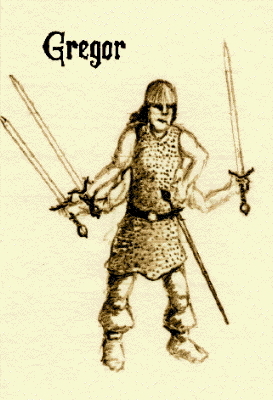 Gregor is a martially minded Barbarian who wields four longswords. When enraged he resembles a possessed windmill more so than a thinking, reasoning denizen. I actually recognize Gregor from a particular story during my caravan traveling days. The caravan he was guarding was ambushed in a ravine by a herd of raptors - vicious, predatory, carnivorous dinosaurs that hunt in deadly packs. All the guards were killed but for Gregor, who was severely wounded at the time. He killed the last five raptors in single combat and successfully led the caravan to the nearest town, preventing further loss of life or property to the caravan merchants. I recall hearing the story from one of the merchants who was so moved by the event that he asked me to tattoo an image of the battle on his arm. On the 13th of Mavis, 1004, Gregor was slain in combat. A glorious ending for a Barbarian. During combat with a monstrous Guulvorg and its master, the party suffered their first fatality. Standing toe-to-toe against this regenerating beast was a bit more than Gregor could withstand. His valiant efforts were not in vain, as beast and master retreat into the night. Unfortunately, no amount of healing can revive our fallen comrade. Long live Gregor! Accompanying Gregor is a large dog. An 'English Wolf Hound'. A faithful companion, an eater of scraps, and chaser of rabbits. Lupe isn't some sort of familiar or celestial creature. He's just your ordinary campfire companion. Some might say he barks too much, and smells of skunk, but he's always faithful to his master and that's all that really matters for Gregor and his trusty Lupe Garou. Accompanying Gregor is a group of cocky, overconfident, low level, hirelings. 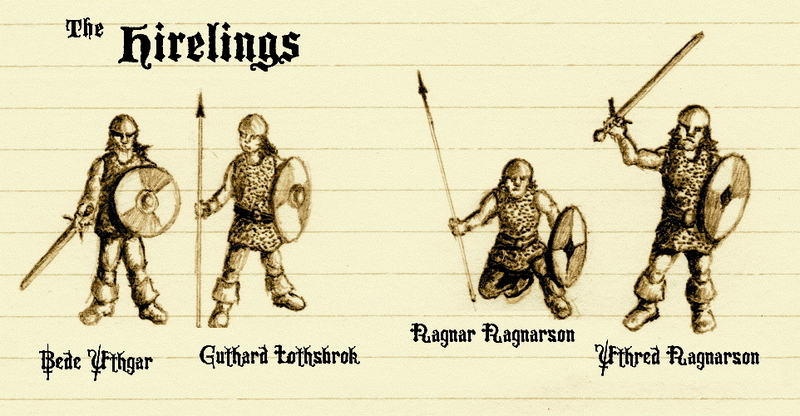 (Bede Uthgar, Guthred Lothsbrok, Ragnar Ragnarson, Uthred Ragnarson (brothers)) These mercenaries were hired in Whillip, and Gregor trained the crew himself. They get fair pay for their services (10gp/month when they're not accompanying Gregor on an adventure, and 1gp/day when they're out on an adventure), but all they've been called for is guarding horses and Gregor's dog. How will they fare when the ichor hits the fan? Only time will tell.